Tucked away in the Cascades, north of Highway 58, is a lake that is referred to as the “Gem of the Cascades”. Mo and I have thought often about traveling the three hours or so to this beautiful lake to camp, but for many different reasons, we never quite made it until now. Waldo Lake, although truly beautiful, is also very well known for it’s mosquito population. People who know Waldo warn that the only good time to camp there is in late summer and early fall. 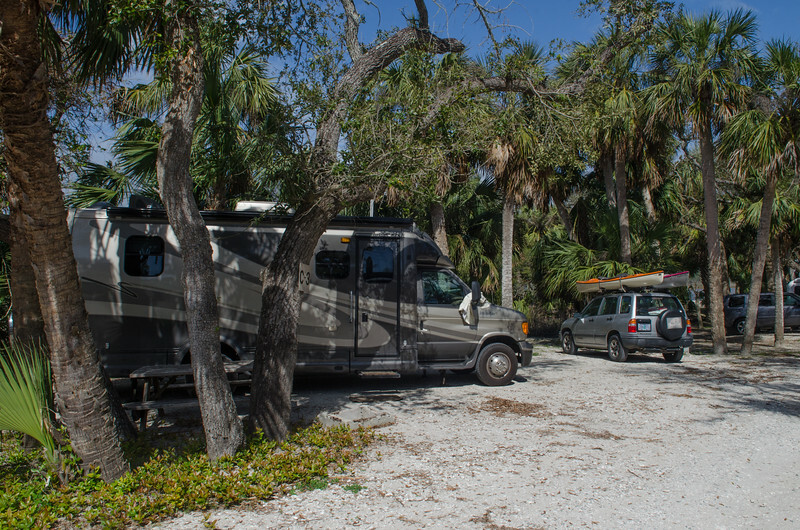 However, we thought that with a motorhome for protection, and our desire to be out on the water in the kayaks, it wouldn’t be too much for us to handle. Besides, it will give us some good practice for Minnesota and the northern Lake Superior region later this season. We left by 9 this morning, and made it to the Diamond Lake Junction cafe just in time to savor another fabulous breakfast. The small tables are adorned with handwritten notes from diners all over the country, touting the wonderful food and friendly people who run this tiny, inconspicuous little restaurant. The cook laughed when we shared our “Bigfoot” breakfast and still needed a good sized to-go box for the part we couldn’t finish. After breakfast, continuing north on HWY 97 to HWY 58 was uneventful, and in no time we were on the forest service road leading north to Waldo. After some internet research, and exploring Google Earth a bit, we determined that the Islet Campground would be our best bet. North Waldo Campground has a boat launching facility, and Shadow Bay at the southern end of the lake is much more thickly vegetated and as it says, shadowy. When we arrived at Islet, much to our surprise, there was only one campsite taken out of the 48 or so available. Some Forest Service workers laughed when we asked why, and told us that the mosquitoes kept most people away, and suggested that we take an open, sunny, and breezy site. This wasn’t a problem, since the campground was empty, and we had great fun picking our perfect spot. By the time we left the next day, there were still only 3 campers in Islet, and maybe a half dozen or so more north of us in the North Waldo Campground. Amazing. Our site was adjacent to the bike trail along the lake, and just a few hundred feet down a gentle slope to our own little sandy beach. We set up camp, sprayed ourselves down with DEET, and checked out the surroundings. The sky was brilliant, the forest deep and rich. The trees were dominantly Western Hemlock and Shasta Fir, with an understory of dwarf huckleberry, a good indication of the cold moist climate at this high elevation. Our view of Waldo Lake was lovely and we took some time to settle in, relax under the trees in our comfy chairs and appreciate all the perfect amenities of our camp, including a really solid, big picnic table in just the right position by our awning, and a fire circle close by. We unloaded the bikes, deciding that a bike ride would be better during the sunny afternoon when the mosquitoes would be a bit less aggravating. The trail circles most of the lake for several miles and is a favorite for mountain bikers. Mo and I have mountain bikes, but I don’t think we would qualify as mountain bikers. The first part of the trail was nice, but as it ascended to Taylor Mountain it got a lot rougher, with roots and rocks in the path, and some very winding twists among the huge trees. We rode a little bit beyond the Waldo Campground and then gave up and headed back to camp. Still, it was a nice ride. The main reason for coming to this lake, of course, was the kayaking, and I was excited to get out on the legendary clear water. Waldo Lake is nestled into volcanic andesite rock, and is the second deepest lake in Oregon, second only to Crater Lake. It is pristine, with some of the purest water in the world, and a recent decision by the forest service to exclude gasoline engines from the lake will help to keep it that way. The lake has no natural inlets to bring in any kind of sediment or pollutants, and fish stocking ceased in 1990. There is very little plant growth, and no algae anywhere. As we paddled along the shore, the views were breathtaking, and the water was as clear as any I have ever seen. The colors reminded me of the Caribbean, with rich deep turquoise and cobalt blues that were nearly impossible to photograph. The wind came up as we headed back across the lake to our camp, and the sheer size of the lake was impressive. It was a truly amazing experience to have this huge lake and pristine forest almost entirely to ourselves. We arrived back in camp to the mosquitoes waking up and getting busy and ready for dinner. We did the same, and Mo built a nice fire for our steaks, while I started up the generator to quickly bake the potatoes. I didn’t have to worry about disturbing anyone with the noise, at least. Supper was yummy, and we sat for a long time afterward waiting for sunset. Walking south along the trail to get a better view wasn’t such a good idea, since the mosquitoes were incredibly thick and bothersome out along the beach. We went back to camp where I sprayed down heavily and walked down to the beach to watch the sun set behind the mountains. We woke early to a morning chill, had some tea and little donuts before getting out on the glassy lake. Down on the beach it was a fight between us and the mosquitoes, and I think they could have carried our boats off if they wanted to. We launched and paddled like crazy to get away from them and for a bit I thought it was going to be a losing battle. Once we rounded the jetty, however, the winds picked up and we left the bothersome bugs behind. Again, our paddle was gorgeous, the water incredible, the views of the surrounding mountains magnificent. The pristine clarity comes with a price, however, and we noticed that there were no water birds around anywhere. The entire time we were there, we saw just a tiny little duck family by the boat launch. As much as I loved the clarity, I really missed the birds. Our murky Klamath Lake certainly isn’t as pristine, but it teems with life everywhere. We decided to dock the boats in the sunny open boat launch area instead of our buggy little beach, so I walked back and got the car and we loaded the boats on top and went back to camp. With the sun up and the breezes rising, the mosquitoes dissipated a bit and we enjoyed a great campfire breakfast. Our spot at Islet Campground, number 42, was probably the very best spot in the entire area. We hope to go back again sometime in the fall, but have also heard that these camps get very busy when the bug season lets up. Packing up was a snap, and we left by noon to head for Mo’s brother’s home in LaPine, just a couple of hours away. It was time for the bi-annual family reunion, with kayaking, and bocci ball, golf and bar-b-ques. Our little Waldo Lake overnighter was a great way to start the weekend. For more photos of Waldo Lake and Islet Campground, click here. Yesterday we enjoyed a sea day. Tonight we will dock in Victoria, but not until 7PM, so I would say this qualifies as a sea day as well. On sea days, the time just rolls by, and before you blink, it’s time to dress for dinner. On this cruise, both formal nights have been held on sea days, which is really quite nice. By morning yesterday, we were in the North Pacific, west of the Queen Charlotte Islands, and shrouded in fog. The fog persisted all day, and it was chilly, so not really conducive to hanging out on the deck. Mo and I had a late breakfast, wandered around the ship a bit, listening to the pianist in the Atrium. We spent some time in the casino, where I actually won a tiny bit of money. We knew it would be a late night, so took it easy, playing cards in our stateroom enjoying the view of nothing, but still enjoying our balcony. There are a lot of scheduled activities on a cruise ship on these sea days, but I do love most the chance to do just about nothing. I get very few real “nothing” days at home in my regular life. Even though it was chilly in the afternoon, the sun tried to warm the fog a bit and we decided to try a swim. We are on the 12th deck, and the terrace pool at the back of the ship is on 12 as well. We discovered that we could leave our room and travel all the way to the back of the ship without having to go into a public space at all. The hall emerges within feet of the pool. It was perfect for us, with no one else in the pool. It was also pretty nice to make a run for the room and the hot shower after our swim. The water was heated, and is fresh water, which is nice, but the wind was still really cold. It did feel good to get in a bit of a swim, though. We dressed early for dinner, and took our cute little printed invitations to the Captain’s Circle cocktail party. Since we are two time cruisers with Princess, we are now part of this elite group. The captain informed us later that this elite group numbers more than 10 million, so I guess it’s not that elite. We had complimentary rum punch and cute little canapés while we listened to the captain tell his story, and applauded the cruisers with the most cruise days on princess, a couple with 440 days at sea! Gee, that would be a year and a half of continuous cruising. They were pretty old, so maybe they have had 20 years or so to rack up those days. It would have been interesting to see their trips. The third place couple were fairly young, but only had 150 days or so. I guess you would have to really like cruising to get into a group like that! There were door prizes as well, and we wondered a bit how much longer the program would last and what we should do next. Calling out the names of the winners, suddenly there it was, “Ms Sligar?” Mo won a bottle off champagne! What fun that was for us, and they eventually delivered the bottle to our dining table and then we took it to the stateroom. The formal dinner was excellent, with lobster and shrimp and beef wellington for Mo. The prawns were nearly as big as the lobster, but even as a shrimp lover, I was delighted with the lobster. Yum! We went to the casino to win a little bit more and then to the last production show of the cruise, “Do You Wanna Dance”. Once again, this show was truly excellent, with great dancing and costumes, and lots of lights and glitz. I loved it. I so love the dress up nights, as much for watching all the other folks as for dressing up myself. It’s fun to be shiny and glitzy and have a chance to wear rhinestones and sparkles and not appear ridiculous. Today has been another quiet time in the cabin, punctuated by a meal here and there. After morning tea, we started watching a movie with Sandra Bullock, “The Proposal” and couldn’t get away for breakfast until after ten. Of course, the Neptune deck “Taste of Alaska” buffet was scheduled for 11:30 so I had just over 90 minutes to get ready for more food. Finally this ship came through with the carved fruit, ice sculptures, and fancy production. The Alaskan salmon was poached, delicate and perfect, the sushi was fresh and tasty, and I do love having all the pickled ginger that I want with my sushi. Mo and I shared another Alaskan Summer Ale with our meal and then headed back to try to finish spending our casino money. On this ship, if you win, you have to cash out to your cruise card. This could be really dangerous, since there is a green button on the slot machine that is called “charge to your cruise card”. Stay away from THAT button. If you win, you cash out to your cruise card casino account and the money is waiting for you the next time you put in your card. I had 6.95 left in my casino account that I really needed to finish off, so plugged in the card to play. After a long time, I had to decide to give up since I couldn’t seem to lose. I cashed in my casino card just an hour before the cruise casino official closing with $70.00 to the good. With the champagne for Mo and the winnings for me, it turned out to be a winning trip! This afternoon we are slipping into the quiet time of packing for disembarkation tomorrow and finishing up our day. Our landing in Victoria awaits, but it’s a bit of an afterthought, especially so late in the day. We haven’t planned much, but hope to enjoy the city a bit before getting back on ship by 11 for our final sailing to Seattle. Ahh, something else I forgot to mention. In the past I have had a lot of trouble with being sea sick. The last couple of cruises have been easier, and on the last one I only needed a patch for a very short time. However, after getting terribly ill in Key West on the trip to the Dry Tortugas, I bought some sea bands. They work by applying pressure to meridians and are said to work for morning sickness as well. I am a huge fan! They really DO work, and no drugs. I will keep them with me always, not just for cruises, but for busses, and any other time I might get motion sickness. What an amazing thing! We set the alarm for Skagway, knowing the day ahead would be long and full. This time we decided to do one of the Princess excursions, because we didn’t want to miss the chance to do the two things really important to us and still get back to the ship on time. Skagway is a delightful little town, with an old fashioned boardwalk, and some good shopping, but our focus on this day was riding the White Pass Railroad and going kayaking. T he White Pass Railroad is part of the epic history of the Klondike Gold Rush, with the construction of a narrow gauge train 112 years ago. The White Pass & Yukon Route was designated an International Historic Civil Engineering Landmark, along with the Eiffel Tower and our recent destination, the Panama Canal. In addition to the many hazards and obstacles the builders overcame, they built this railroad in two years, two months, and according to some storytellers, two days, two hours, etc. etc. Riding this train is a fabulous experience, unlike the many touring trains that dot the western landscape, this one has real views, and tunnels, and trestles, and has such an amazing history. Fascinating as well, was the young woman narrating the journey. She was born in Skagway, a town of about 800 residents and a population that drops to less than 500 in the winter. She graduated in a class of seven, all them them with close to a 4 point average, and all of them continuing that average when they went away to college. Her family has a gun business and a restaurant and were long time Skagway residents as well. She is entering medical school this fall and plans to be a plastic surgeon. She gave us lots of information about the train and the journey, but because we were in the “sound car” we got to hear her side conversations with some other people about what it was like to grow up in a small tight community like Skagway. The train climbs from sea level in Skagway to nearly 3,000 feet at the summit of White Pass, in just 20 miles, passing through some of the most magnificent terrain in the US. The purpose for this train was to get people in and out of the Klondike, in anticipation of the huge gold rush expected there. What I didn’t know before this trip, was that that huge gold rush actually burned out after only two years, with very few people actually making any money. But the stories of steam engine number 9, and the rotary snow plow number 1 were fascinating. Other stories from Skagway include the notorious “Soapy” Smith, a thug who ran the town until he was killed by another thug who was then eulogized as the man who saved Skagway. I took a photo of the “trail of 98” where men hauled literally a ton (2000) pounds of goods over the pass for hundreds of miles on their backs. They had to make many trips because the Canadian government at this time wouldn’t allow a foreigner in the country without enough provisions that they wouldn’t become a drain on the Canadian economy. It was said if you lost your place in the line of men on this tiny trail, it could take a day to get back into line to continue forward. What a story. After White Pass, we got off the train at Frasier, British Columbia, to begin our kayak trip on Glacier Lake. Our guides were typical young, adorable river boys, who gave us a lesson in tandem kayaking with a rudder, helped with our skirts and life jackets and let us out into the lake. Now you know that Mo and I are kayakers, but we do usually each have our own. It’s fun trying to figure out who is in charge when there are two people in a kayak. We did fine, eventually, and I did eventually figure out the rudder pedals. The lake was lovely, clear, and windy, with protected coves. The wind saved us from what I assumed would be legendary bugs, with only one mosquito to mar the day. Just one. That was amazing in itself! The mountains around us were topped with snow with several glaciers visible. The lake is in a place called Tribulation Valley, desolate and windy and incredibly harsh. We were on the water for just over an hour, not nearly enough, before we had to return to Frasier and the waiting coach. The train up the pass follows the east side of the river, and the Klondike road on the west side of the river was our route back down to Skagway. Our coach driver told us stories about Skagway and the local history as she negotiated many bikers from Sockeye tours who refused to move to the right of the road to let the bus pass. She had a few pithy comments about Sockeye, and asked us to please not do a tour with them, ever. From the way everyone talked, it was obvious that this was a small community, supportive of each other, but also much like a small family with some infighting as well. By the time we got back to Skagway, I was starving and grumpy, and made a beeline for someplace to eat. After an Alaskan Amber and a burger at the Alaska Brewing Company I felt much better. The restaurant was great, and looked historic and interesting, but a closer look at the historical walking tour brochure revealed that the building was erected 3 years ago, called Old Town Skagway. The town itself is completely taken over by tourism and the cruise industry, with only a few local businesses on some of the side streets. Again, Diamond International and all the associated Caribbean jewelry stores dominate the main street of Broadway, with just a few interesting local shops caught in the middle. The town was crowded and busy, and with a population that swells daily from 800 to 10,000 or so with the cruise ship arrivals, it was certainly more like Disneyland than a true Alaskan frontier town. Mo and I were shopped out, even though we haven’t really bought a lot of “stuff”, and walked back to the ship. Again, the flowers were brilliant and gorgeous, the skies a perfect blue, and the mountains magnificent. When we left Skagway, Kathy talked on the microphone about the glaciers and waterfalls, and Mo and I braved the incredible winds at the front of the ship to get great photos. We passed Haines on the right, the mountains adjacent to Glacier Bay to the north, and got an extremely rare view of three magnificent glaciers as we cruised down the sound. I took a ton of photos. Perfect. Perfect that is, until this morning, when I discovered the horrific fact that I left the smart card in the computer and took all those photos without a card in the camera. Geez, you would think a camera would tell you something like that. So, no photos of the extremely rare sunny departure from Skagway, while we listened over and over to just how incredibly lucky we were to see the glaciers and the mountains. We were, I just don’t have photos of that experience! Again, we skipped dinner in the dining room at 8 in favor of the production show. It was well worth it, finally, this show was fabulous. “I’ve Got the Music” was filled with great dancing, great singing, and all the bells and whistles. We felt that we had truly been entertained. It was so good that we decided we would have to go to the 10:15 show after our formal dinner at 8 on our sea day tomorrow. I fell into bed filled with visions of mountains and glaciers and lakes and all the wonders we had seen on this day and slept like a rock! This was a day that fit all expectations of what a cruise to Alaska might be. All night as we slept the ship cruised north through Chatham Strait and when we woke there was thick fog all around us. I felt relief as the fog lifted and fell, and in the distance, I could see the sidewalls of the fjord coming closer. Amazingly, we had a clear day, with only some high clouds, but nothing to obstruct the views of the magnificent mountains all around us. We heard that the mountains had not been seen for days prior to this one. Dressing warmly, we headed for the upper decks to watch as we entered Tracy Arm and our encounter with a glacier. I really had no idea how impressive this trip would be. The trip to Sawyer Glacier from the entryway into Tracy Arm is about 27 miles. It was breathtaking, and only became more so the farther we traveled. Our captain has more than 30 years of experience, and as I watched the icebergs getting bigger and bigger I felt grateful for his skill. Mo and I went to the forward upper decks to see as much as possible. The winds were incredible, and the air was cold. Gee, ya think? After all, it is a glacier and those are ice bergs! After a bit of time, I went back down to the pool deck to find tables of mittens and hats and blankets for sale and they were doing a hefty business. I bought some gloves. Once more, back to the upper deck to see the icebergs and watch for the first view of Sawyer glacier. I think I should have known somehow that icebergs and glaciers were blue, but I didn’t, or at least I didn’t have a clue just how blue. The glacial blue is a translucent turquoise, pale but lit from within. It’s a bit like that Caribbean color that I love, only surrounded by ice rather than warmth. When we reached Sawyer Island, the ice was too thick for us to continue any farther up the fjord for a closer look at the glacier. The captain rotated the ship around while some people boarded a small excursion boat taking them deeper into the fjord. I can see why a cruise to Glacier Bay might be impressive, with much closer encounters. For my first trip to Alaska, however, I am grateful for what I did see, and incredibly grateful for a clear sunny day to see it. As the day wore on, we kept hearing over and over how very lucky we were for the lack of rain and fog. It seems that we brought the sunlight with us, because everywhere we went we heard that it had been raining hard for the last three weeks until we arrived. Perfect. The boat turned and headed back out of the fjord. By the way, another thing I should have known but didn’t, is that a fjord is a glacially carved inlet with tidal salt water, no beaches and vertical walls. I am ready now to see the Scandinavian Fjords, or maybe those in New Zealand. As we headed back out of Tracy Arm, we passed another ship, the Golden Princess, and had fun cheering each other as we passed. It was a perfect chance to get a photo of a ship identical to ours in the fjord in a way that we couldn’t get while actually on our own ship. Another great thing on this cruise has been the commentary by Kathy Slamp, a delightful woman and naturalist who has lived in Alaska much of her life. Kathy discussed the landscape, the geology and geography of the glaciers, in addition to some of the colorful history of the area. Kathy conducted a daily lecture series in the theater, with slides and stories that helped us more fully experience the landscape where we traveled. We were out of Tracy Arm by 10 am, heading for Juneau. Arrival in port at 2 in the afternoon was accompanied by brilliant, clear blue skies and magnificent snow topped mountains. Again, Mo and I decided to do our own excursion. Our boat was docked at the farthest possible place, so we bought a shuttle ticket to town, and once there found another inexpensive shuttle to the Mendenhall Glacier just out of town about 15 miles. I’m not sure what the excursion would have cost, but for us, paying $17.00 each to do our own thing was perfect, and we didn’t have to adhere to someone else’s schedule. The visitor center at Mendenhall Glacier is managed by the Tongass National Forest. There are trails and viewpoints, ponds and wildlife, and signs about the glacier. Mo and I took off on the hike to a waterfall just east of the glacier. Previously, as we cruised Tracy Arm, we saw many waterfalls, some of them 1000 feet high, yet they appeared dwarfed by the immensity of the landscape around us. Hiking to this waterfall gave us the opportunity to see just how massive these falls are up close. Mendenhall Glacier is part of the Juneau Ice Fields and is rapidly retreating. Another local comment: “See the Mendenhall Glacier before it’s gone”. On the trail, we met another woman, walking the trails trying to find a way across the stream. She had lived in Juneau for more than 40 years and said she hadn’t seen the water as high as it was this year in that stream. She also pointed out a spot on the landscape, very distant from the present terminus of the glacier, and said when she moved to Juneau, that was where the glacier used to be. Global warming isn’t just a concept in Alaska, it’s real. Everyone in the state talked about the retreat of the glaciers. It’s dramatic and measureable. After our hike we took the shuttle back to town in time to do a bit of shopping. Juneau was much bigger than Ketchikan, in fact, there was even a good deal of five-0-clock traffic. The shops were interesting as well, and we stopped in to visit the famous Red Dog Saloon for an Alaskan beer. The place was noisy and fun, with sawdust floors, a colorful history, and some live music from a honky-tonk piano man and a crunchy old guitarist. By this time, we were beginning to wear out, so even the delight of nice shops couldn’t keep me going and we headed back to the ship. Leaving Juneau was sunny and gorgeous. How lucky for us! We decided on an early supper in Horizon Court so that we could go to the production show at 8:15. The show “The Piano Man”, was better than the previous one, but still not a very impressive production show. Mo and I have been watching “So You Think You Can Dance” and decided that it made us a bit snobbish about choreography and good dancing. We were definitely tired when we retired to our cabin for the night. We have discovered that an Alaskan cruise isn’t as relaxing as one to the Caribbean. Sitting here discussing, and wondering just why that is: maybe it’s the lack of sun time and deck time, or maybe the wild landscape around us that is so stimulating. We are hiking more, perhaps, and quite a bit more active, even though we do a lot on most cruises, it seems different somehow. It’s a beautiful cruise destination, but the cruising experience itself feels quite different. Arriving in Ketchikan this morning was dramatic. The sun rose long before we were awake, but the heavy lined drapes let us sleep longer than we had planned. By the time I opened them wide to look outside we were very close to our first port. The mountains around Ketchikan are beautiful, lush and green. It is, after all, a rain forest, with precipitation over 100 inches a year. Our plan was to explore the town on our own, avoiding lines and costly excursions. Ketchikan is a small place, with few roads, and the town is clustered along the waterfront. Leaving the ship entails a photo opportunity for the cruise photographers, and for some reason on this cruise they seemed to think that huge cartoon animals are cute. Later, when we looked for our photos, it was hard to see anyone in between the giant salmon and giant fisherman in a brilliant yellow slicker. We surely didn’t need to buy THAT photo, even though we both looked OK. Kind of silly, really. On shore, we walked to the end of the dock, down the gauntlet of people hawking excursions, taxi drivers trying to get fares, and Princess personnel showing the way to the prepaid tours. It was surprising just how much it felt like any other cruise port in Mexico or the Caribbean. Still a lot of people around trying to sell you something and get your money. Then, along the main road next to the dock, there are all the Diamond International, Tanzanite International, and all the other jewelry stores found at cruise ports all over the world. What a racket! Duty free diamonds. But wait! Isn’t Alaska in the US? Would I have to pay duty anyway? Mo and I followed my daughter’s advice and avoided the first streets in favor of the smaller back streets and truly local shopkeepers. The big stores are dominantly owned by the cruise lines, and certainly don’t do much to bring in real money to the locals. On this day, however, shopping was our second choice to walking. The town of Saxman was just a nice 3 mile walk along the waterfront and gave us a chance for some quiet and some nice views of the channel. Ketchikan has the largest number of ceremonial totem poles in Alaska. We walked past cannery row and the Coast Guard station, through thick forests with salmonberry and ferns, punctuated by small waterfalls. Along the way I met a sweet little very tiny lady with 5 cats and a gorgeous garden filled with flowers. She had lived in Ketchikan since the early 70’s and was happy to visit with us. I was surprised at the flowers everywhere, most of the shade and moisture tolerant types due to the heavy rainfall. The delphiniums, however, were in full bloom, farther along than my own in Rocky Point. The visitor center at the totem pole park was nice, and the local staff were helpful and informative. For a buck, you can buy a map of the poles with the history of each one. We learned that even though they are made of durable cedar, many of the original totem poles have deteriorated and most of them have been redone. The re-carving is considered an important work and done with great pride by superior tribal craftsmen. The gift shop on the premises is run by the tribe, and there is also a clan house, with traditional dancing and singing performed periodically. The carving shed is there as well, with a carver working on site. You can watch him through the windows if you wish, but he only allows visitors inside at his discretion. After enjoying the totems, for another buck, we caught the local bus back to town and were dropped off right in the center. Things were a bit more crowded here, so we walked back to the Ketchikan Coffee Company for a cappuccino. Another great local spot, with art on the walls done by the infamous Ray Troll, famous for his creative wild art, and an Alaska favorite. Creek Street is the classic row of one time brothels and bars, now converted to shops and a brothel museum. Most shops here are locally owned, and the boardwalk area is quite picturesque reflected in the creek. Spending three bucks each to ride the tram up the hill was well worth it, and the Tlingit lodge at the top is lovely, filled with art and informative photos about the local history and tribal economy. Walking back down to town, via the “Married Man’s Trail” was lovely as well. We sidetracked a bit, ambled along the creek viewing salmon ladders, checking out the local homes, and visiting a bit with some local residents. Back to the ship for our boarding in plenty of time to find a spot on the upper decks as we left Ketchikan. Even though it was cloudy, there was no rain and the views were lovely. A local story of Ketchikan follows: Someone asked a young child, “how long has it been raining?” , and the child replied, “I don’t know, I’m only five”. This cruise wasn’t really planned much in advance. After all, we did just do a wonderful two week trip through the Panama Canal back in January. But one day, Mo just said, “How would you like to do the Alaska Inside Passage” and before long we had our cruise tickets and our air miles took care of the transportation to Seattle for another great vacation week. Mo has been to Alaska but I haven’t. She drove the highway many years ago and camped in her Scout among the mosquitoes. We still plan to make a MoHo trip there before long, but in the mean time a cruise is my perfect introduction to the state. Cruising can be addictive. As the days passed and the time to leave got closer, I found myself fantasizing about the slow slide of the sea, and the way a cruise slows my own internal pace. I watched the weather, seeing temperatures in the high 50’s and rain for most of the trip, and I didn’t care. I was going to Alaska, and I was going to relax, and watch the sea and the sky and the mountains, and get waited on for a whole week. Ahhhh. We left early Sunday morning from Medford, and found to our delight that Alaska Airlines still serves complimentary wine on their flights to Seattle. So what if it was only 6 in the morning, we mixed it with orange juice and thought it was a great start to a fourth of July day. I couldn’t see passing up that sweet little freebie, especially when we had to pay surcharges for all sorts of things, including our luggage. By the time we reached Seattle, the dark northwest clouds had descended, but it really didn’t feel too terribly cold. We had a light breakfast in the airport while we tried to entertain ourselves until the ship shuttles were functioning. By 11 we were on a bus to the Magnolia District and by noon we were actually on the ship. It was the slickest, quickest, cleanest embarkation we have experienced on any cruise so far. Impressive! Especially so after our last experience with Celebrity, such a great cruise line, and yet they didn’t even come close to the efficiency we experienced with the Princess staff. Once on board, even though staterooms aren’t usually ready so early on the day of embarkation, ours was ready and waiting. We unloaded our carry-on’s and headed up one deck up to the Lido for the welcome buffet. This is the first time we have taken a room on an upper deck, and ours is in the middle, right at the central elevators. It’s also our first time with a balcony room, and I love it! Even if it’s too cold to just sit out there all the time, the view is open and wonderful, and we can leave the door open at night for fresh air. I think comparisons are inevitable since we cruised so recently. Our last cruise before the Panama Canal was with Princess as well, and I found myself trying to remember just how different the Crown Princess was from our current ship, the Sapphire Princess. I also find myself continually comparing this ship with the Celebrity Constellation. It is really surprising to me that two ships in basically the same class (Crown Princess and Sapphire Princess) can be as different as they are. Last night and today, we have been exploring. Much like the Crown Princess, and very much unlike the Constellation, there are many areas on this ship are disconnected to other areas. There are three sets of elevators, but they all don’t go to the same floors, and sometimes you have to change floors to continue to the aft or forward portion of a deck. It makes for a lot of walking and climbing, a good thing for us, but not necessarily for everyone. This trip, for the first time, we chose second seating dinner at 8. Last night we went to the early show at 7 and then to dinner at the International Dining room. The theater was large, but not especially lovely and the show was just ok, with a few dance numbers and an OK comedian. Thinking this schedule would work for the rest of the cruise, we were a bit daunted to find out that this ship doesn’t have an early show and the only way we can go to both dinner and a show is to do the late show at 10:15 pm. Maybe not! I am a morning person, my kids all know this about me, and know that trying to call me after 8pm at night will result in a pretty stupid conversation. I also know that if I call them at 5am when I am all bright-eyed, they might not be so chipper either. Except for Melody of course, who is chipper on the radio at an ungodly hour. But I digress. Our dinner was adequate but certainly not memorable, and the dining room a bit boring. However, we did have our table for two ready for us without a hitch. The fabulous two story dining room with the incredible elegant food that we enjoyed on the Constellation came with a price. We had to fight for our table for two after some glitches, and when we did finally get one, it was right next to the work station. Entertaining, but definitely noisy. I guess there are trade-offs, no matter what. I do miss those wonderful dinners with all the flatware and elegance. Here, we both decided that we could miss dinner in the dining room without feeling as though we were missing something, and plan to do so tomorrow night so we can see the show without staying up till midnight! Our only goal for this first sea day was to refuse to rush around anywhere, and to do everything in a leisurely way. My goal was to find the fine line between leisurely and lazy. The morning began with a brisk walk on the top deck jogging track, small enough that it takes ten laps to get in a mile, but certainly nice enough. The skies were clear and blue and it was windy! Then down to breakfast, which by the time we got there, was very crowded. We found a table outside the main part of the cafe, and especially enjoyed the really good watermelon. ‘People-watching’ has been fascinating on this trip as well. The crowd is completely different from any cruise I have experienced, with lots of cultural diversity, an even mix of age groups, many young people, and lots of families. The pools and ping pong tables seem to be kept pretty busy with this bunch. Midmorning we explored the ship some more, found the Alaska cruise companion book with maps, and settled into the cafe area on the fifth deck for cappuccinos. A late lunch in the Savoy Dining room was delightful, with a traditional English Pub offering of fish and chips and Bass beer. An afternoon of cards in our room punctuated by whale sightings, and somehow it was time to prepare for the formal night dinner. Dressing up is always fun, but this time it was also incredibly entertaining to see everyone else in their finery. Japanese women, young and old, were wearing special traditional lovely silk embroidered gowns. Indian men wore colorful pashminas over their tuxedos, and some women were in saris. It was fascinating. The captain greeted everyone and introduced his crew, and champagne flowed freely. Dinner was filet mignon, and again, adequate but forgettable. It is 10:30 now, Mo is sleeping while I write, and the sun has finally dipped below the horizon. Tomorrow we will see Ketchikan, arriving early in the morning and returning to the ship by 3:30. Alaska at last, traditional Alaska with totems and Creek Street. As I watch the shadows of the wild coastal mountains coming closer in the twilight, I am filled with excitement about what is waiting ahead.